“It’s OK, some people just aren’t good at math”. We’ve all heard this before. In fact, some of us have probably even thought it about ourselves (“I’m just not a math person”, “I’ve just never been great at spelling”). But there’s a problem with this mindset: Not only is it not true, it’s hurting our children. By believing the myth that talent is hardwired in our brains, and that some of us are naturally better at certain things than others, it keeps kids (and us, as parents and educators) from knowing that with a little hard work, dedication, and self-confidence they can improve. The idea that math ability, or any ability for that matter, is an immalleable trait perpetuates the harmful myth that intelligence and creativity are mostly genetic. Research has pointed to two orientations of individual’s conceptions of ability: incremental orientation and entity orientation, sometimes also thought of as Fixed and Growth mindset1. Students who lean towards a more incremental orientation believe that intelligence is malleable and can improve with effort. On the other hand, individuals whose ideas of intelligence align with an entity orientation believe that their abilities are fixed; you are born with a certain level of intelligence and no amount of effort can change this. In other words, incremental orientation suggests that what you do affects what you know. Entity orientation suggests that who you are affects what you can do. An entity orientation can lead to students giving up in subjects that they aren’t excelling in, likely because they believe that they are inherently incapable of excelling and any efforts to improve would be wasted energy2. Another study found that women who believed their math abilities were fixed and unchangeable showed less interest in math related tasks and were therefore more likely to “fall prey to the gender gap that exists in mathematics fields”3. In this way, an entity orientation may make people more susceptible to “stereotype threat”, or the tendency to believe that you are more or less prone to something because of the innate abilities of the groups that you are a part of. A recent nationwide, longitudinal study also supports these findings, suggesting that both male and female students who believed that their abilities were fixed genetic traits may keep them from later majoring in STEM (science, technology, engineering and mathematics) fields4. 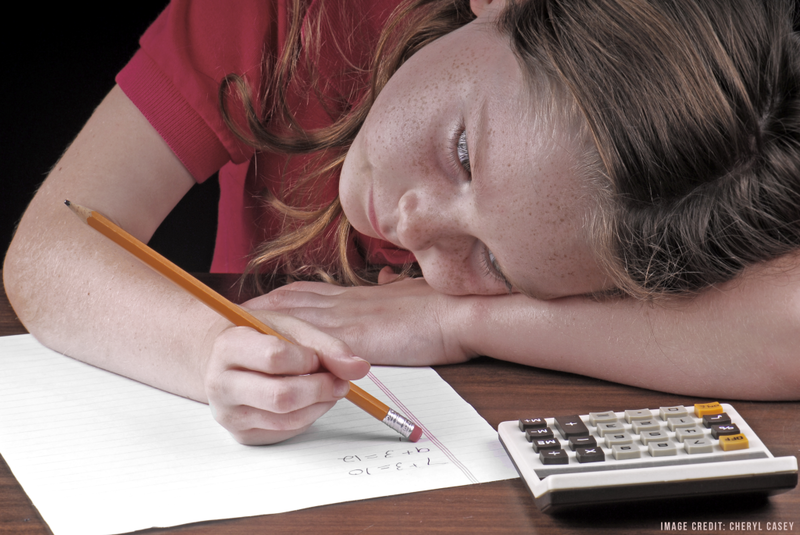 One author of the study suggests that “students may need to hear that encountering difficulty during classwork is expected and normal,” and that anyone can be good at math, or any other subjects they’re struggling with. This mentality, what scientists refer to as the “growth mindset”, seems to equally benefit both boys and girls5 and suggest that teaching this message in schools will help encourage more girls to pursue careers in STEM fields. However, there are still a disparagingly low number of women in STEM fields, with men outnumbering women 3 to 16. Recent research is pointing to one possibility: academics that believe in the concept of innate talent may lead to bias. Findings suggest that the more professors thought that innate talent was necessary to succeed within certain fields (namely philosophy, music, economics, and math), the less likely women and African Americans would dominate that field7. This mindset may be limiting people’s opportunities before they even get started. In other words, it may be just as important for teachers, professors, and leaders to believe that students have an incremental orientation as it is for the students themselves. So how can we fix this? For starters, we can focus on teaching people of all ages the science behind a growth mindset. The first step towards incorporating these ideas in the classroom is making sure that teachers themselves believe them. Innate talent is a myth and our brains are constantly developing, even into adulthood8. This is evident in the dynamic memories of New York City taxi drivers9 or even playing games like Tetris (which research has found may thicken the cortex, or outer layer of the brain, in adolescence10). And this concept isn’t only relevant to students who are struggling; even students who advance in math can improve their cognitive abilities11. Teaching students these facts about the brain can actually help them learn. A new study has found that students who struggle in school actually improve once they’ve been taught that intelligence isn’t fixed and can advance with hard work12. Researchers have called this concept “mindset interventions” – students spend around 45 minutes reading and writing about articles on the brain’s ability to grow and develop. While improvement in grades is only around one-tenth of a letter grade, this is still really impressive considering students spend less than an hour on these ‘interventions’. The key to these interventions is a supportive teacher who “encourages students to take advantage of such opportunities”12. Psychologist Carol Dweck and colleagues have shown that experiences as early as elementary school often reinforce mental habits that support the myth that intelligence is a fixed, genetic trait13. She has found that children come to an unconscious assumption that tasks given at school (such as quizzes, in-class assignments, or homework) are actually opportunities to measure how smart they are rather than innovative ways to challenge their intelligence. For these children, performing poorly on these assignments shows that they lack intelligence rather than being an indicator of how much more they have to learn14. Because they believe that the main reason behind these tasks is to measure their competence, these kids try to pick the easiest task to complete, which unfortunately means that they aren’t challenging their intelligence and often lose out on the full benefits of learning. Dweck and colleagues have also shown ways to improve kids’ outlooks about their intellectual ability. They explained to a group of at-risk junior high school students that intelligence is highly malleable and can be developed with hard work. Most importantly, they explained to these students that they were in charge of their intelligence and with hard work could guide their brain’s improvement during the learning process. What they found was that convincing students that they could make themselves smarter made them work harder and achieve higher scores. This effect was seen even more so in students who initially believed that intelligence was an innate, genetic trait. Dweck reported some very emotional stories of junior high school boys who were “reduced to tears by the news that their intelligence was substantially under their control”15. While these kids felt as though they were given a second chance, they actually had the right tools all along. Teachers face many challenges that are outside of their control and that may impede the learning process; but this is one thing every educator can offer their students that may have tremendous impact on their lives. By adopting a growth mindset themselves, educators can model, nurture, and share the value of an incremental orientation. It’s important to start explaining to children while their young that they have full control of their futures, and intellectual abilities. Just because something doesn’t come easily or naturally doesn’t mean they aren’t smart or can never be good at math – all it really means is that they may have to keep trying.